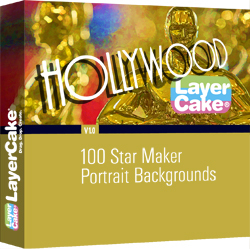 LayerCake Elements’ Hollywood Portrait Backgrounds enables the Creative Artist to place their subject on Sunset Blvd in Hollywood, California – regardless of where you are working from. One hundred (100) professionally captured photos of the Hollywood scene and converted into high resolution portrait matts (backgrounds) open up enormous potential for Photoshop users when compositing images for presentation to clients and friends. Tags: Actors, Actresses, Adobe, America, Americana, California, Digital Backdrops, digital backgrounds, Digital Compositing, Graphic Design, Graphic Designers, Hollywood, Hollywood & Vine, Hollywood Star, how to photoshop, Location Scouts, Location Sets, Oscar, Photographers, Photoshop, Photoshop Users, portraits, Professional Photographers, StudioMagic, Sunset Blvd. Take a trip through Hollywood, California… down Sunset Blvd when you preview the Hollywood Portrait Background Collection in the slideshow below.